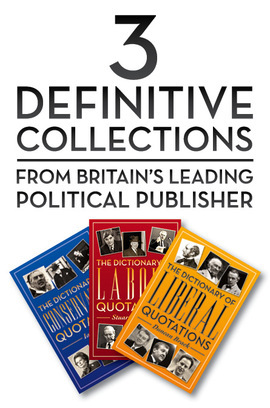 Fancy owning the definitive collection of political quotations? We’ve put together all 3 of our quotations books for the price of 2. You’ll need this thoughtful and entertaining assembly of conservative quotations if you’re at all keen on politics. With more than 2,000 key quotes, this authoritative collection contains all the best conservatives and their sayings, whether they were standing up for what’s right or standing up to the left, showing off their wit or showing that their foes were witless. It’s got all the big names: everyone from Aquinas to Bagehot, Churchill to Cameron, Shakespeare to Thatcher. In The Dictionary of Conservative Quotations you’ll find humour (Quayle) and inspiration (Burke), political punches (Hague) and ancient wisdom (Aristotle), all wrapped up into one slick, easy-to-use compendium. This book makes a vital reference source for anyone who cares for politics or the Conservatives and is a must-have for everyone with an interest in conservative thought. Anyone who has an interest in Labour or the left needs a copy of this brilliant compendium of left-leaning quotations. The collection features all the best quotes from all the great thinkers, whether they were reactionary or revolutionary, campaigning or policy-making, thinking aloud or writing it all down. The likes of Marx, Miliband, Attlee and Aristotle stand side by side in this neat reference guide, where you’ll find the best of Brown, Blair and Balls along with all that Rousseau, Robespierre and Russell had to say. The Dictionary of Labour Quotations brings together insights, remarks, retorts, wit and wisdom, making it essential reading for everyone with a passion for the Labour Party, socialism or the left side of politics. If you’re a liberal or a democrat, and especially if you’re a Liberal Democrat, this masterful and considered collection of thought-provoking quotations should belong to you. All the great Liberals are packed into this slick reference guide, from Gladstone to Ashdown, Kennedy (John F.) to Kennedy (Charles). Whether you’re looking for John Stuart Mill or John Maynard Keynes, you’ll be able to find every good quote there is on Liberals and Liberalism. Writers, thinkers, journalists, philosophers and even the politicians themselves contribute with nearly 2,000 utterances, musings, provocations, jibes and diatribes featured in The Dictionary of Liberal Quotations, making this guide a must-have for anyone interested in Liberals and Liberal thought. Each offering a little humour, a little wisdom and a whole lot of fun.